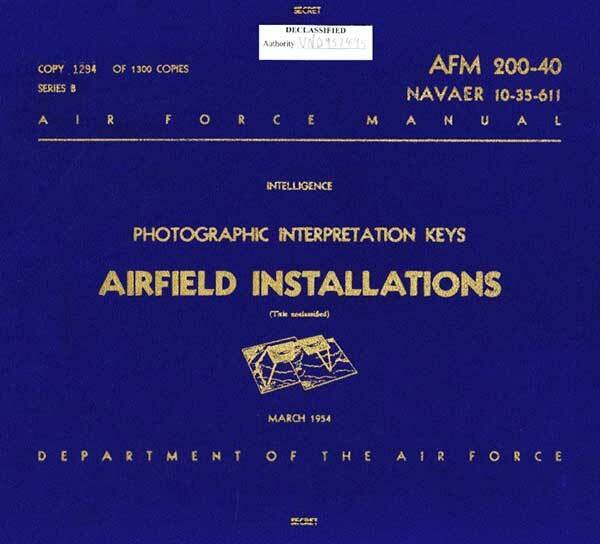 Photographic Interpretation Keys Airfield Installations, AFM 200-40, NAVAER 10-35-611, 1954. This manual shows the basics of photo interpretation. This document contains information affecting the national defense of the United States within the meaning of the Espionage Laws, Title 18 U.S.C., Section 793 and 794. Its transmission or the revelation of its contents in any manner to an unauthorized person is prohibited by law. Reproduction of this document in whole or in part is prohibited without written permission of the office of origin. The original holder and each subsequent recipient agency in turn is held accountable for this numbered document and must notify the respective service office indicated below of any transfer of accountability. 1. Purpose and Scope. This Manual provides Air Force intelligence and operations units with one of a series of keys for the rapid and accurate reading and interpretation of aerial photographs. This particular key is intended for use as a subject key for airfield installations and activities. 2. Utilization. This Manual will serve as a text in photo intelligence officer and airman schools and will serve also as a reference for intelligence and operational personnel concerned with airphoto interpretation of installations and activities on airfields. 3. Coordination. This Manual has been coordinated with the Interservice Committee on Photo Interpretation Keys and Techniques of the Photo and Survey Section, Joint Intelligence Group, Joint Chiefs of Staff. 4. Changes. Proposed changes to the Manual will be submitted through appropriate channels to the Director of Intelligence, Headquarters USAF, ATTENTION: Reconnaissance Branch, Washington 25, D. C.
This Manual contains no copyright material. Zone of Interior and Overseas -- Con.